Often our partners get our old iPhone when we get an upgrade. Did you ever buy an iPhone 4 and hand-me-down your 3GS to your wife? We all did! This week my wife broke her 4GS and had to downgrade to a friends second hand 3GS – the problem is that her MICROSIM didnt fit in her 3GS. Simply remove the SIM tray from the iPhone 3G/3GS. Take your micro sim and place it over the standard sim to outline where to cut. (You can buy a SIM card for $2 however you may have one at home from an older phone). Cut out the shape of the micro SIM and place it inside the standard sim. Place that sim in the tray. And you’re done. It may take some fiddling around and take note this may not be safe for your phone or your SIM card. It works. Simply cut out the shape of the micro sim from the larger standard sim and stick it in place – use sticky tape on the opposite side to the golden chip of course. Lets look at doing it on reverse! 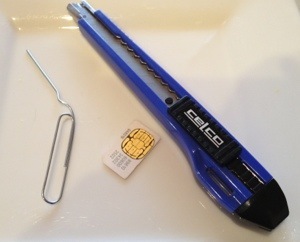 Simply cut the shape of a micro SIM out of the normal SIM card. Be careful you can’t undo this. Check with your telecommunication service provider and handset manufacturer and their terms before doing any of these things. This is a hack. Enjoy!